Open Your Physical & Digital Precious Metals Account Here. Buying gold, silver and platinum bullion worldwide at the touch of a button has never been easier. You can safely store your savings and investments as physical precious metals and seamlessly move them around the world with us outside of the banking system. Our accounts are designed to offer the best solution to all investor types. Small investors get to access the lowest cost LMBA gold we know of at 1 gram, whilst large and institutional investors get access to the best wholesale prices across 4 continents. Soon we will be offering digital bullion that you can use in your everyday transactions and payments instead of normal currencies. Choose this account for the lowest cost physical gold online. Start accumulating gold as little as a single gram at a time, up to a maximum of 100 grams per purchase per day. 6 Months Private Secure Vaulting FREE with each purchase. Delivery of all holdings available from 1 gram upwards. This account type is for investors that wish to buy a minimum of 100 grams of physical bullion at a time. It allows access to the wholesale markets, quantities and prices. Select which of our 7 global markets you wish to vault at. Withdraw and take possession of your holdings anytime. Replace the fiat currencies you use with a digital currency that is fully backed by vaulted gold and silver. We want you to be able to get the best quality physical precious metals at the lowest possible prices. Our retail volumes of 100 grams of gold and less, have the lowest prices on the market. Our Legacy Gold partnership is connected to the oldest gold bullion refinery in the UK, Betts (Est. 1760). The agreement in place with Betts allows you to purchase the lowest cost per gram of gold direct from an LBMA refinery, anywhere in the world. Our wholesale markets are designed to cater to orders up to tonnage. The market prices are purely driven by market supply and demand forces and show the price of the physical metal, not the paper price. Soon you will be able to start buying gold and silver that you can then spend in digital transactions and payments worldwide. You will have exactly the same ability as the other two accounts, in that you can physically withdraw your bullion and have it delivered to you to hold in your hand. The new digital bullion currency will finally allow you to stop using the current fiat paper currencies issued by central banks and governments. The safety of your money and wealth is our foremost concern when you are buying gold. Your account and holdings are as secure as can be made, using the most advanced IT technologies and leading world-class private vaults with unparalleled track records in protecting valuable assets. Take your first steps to start protecting your money by investing into physical gold, silver or platinum bullion. Then just sit back and wait for the verification process to be completed. It can take 2-3 business days to process your application and for your Holding to go live. Once verified, you are under no obligation to transfer funds after creating your account, it will stay open indefinitely with a zero balance. Or, you can start transferring funds to your account where any cash will be kept in a segregated Trust account until you want to buy your precious metals to be privately stored worldwide outside of the banking system. It is important to correctly verify your identity and details before you start buying gold. This allows us to ensure that only you are able to withdraw your bullion and that no-one else is able to. When it comes to your precious metals, security is paramount. If we require any further details we will get back to you swiftly so that your account application is completed as quickly as possible. Physical gold bullion and precious metals provide the best means of safely preserving your wealth for timeless generations. Buying gold and silver bullion allows you to benefit from investing into an asset that will both protect your money and increase in value in times of economic difficulties. Physical precious metals are ideal for pensions and the safeguarding of your current savings. Please do contact us for more information on how you can benefit from investing through us. If you want to open an account and have it sitting there empty as a backup just in case of a potential banking emergency, then please do so (I'd recommend that as a minimum action). 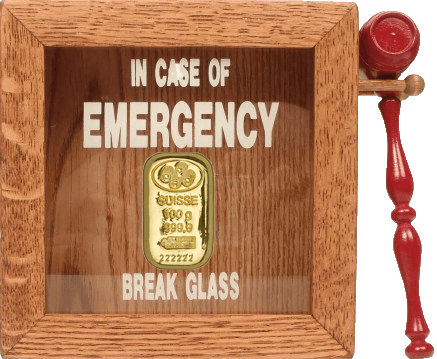 In a financial crisis you must already have a backup plan pre-prepared and in place to give you the ability to react faster than the unfolding crisis (and other investors trying to escape). If not, you run the risk of having the markets and panicking public squash you flat, leaving you with little left. Take the stress away now by knowing you can start buying gold and other physical precious metals at the click of a button. Waiting 2-3 days for the Holding to open pending verification, is an eternity that could cost you dearly, so be forward-thinking and get it out of the way now. There is no benefit to you ensuring that you are locked into the banking system without an escape route. Why take the risk of not doing so when you could start the process today? The most common argument against buying gold, silver or platinum bullion, is that it just sits there and does not 'work' for you to generate income. Stocks pay dividends, cash earns interest (just and if you're lucky) but bullion does neither. This has now changed and that argument no longer applies. ABX and BCX now lead the global physical precious metals industry by offering you the ability to generate income from the physical bullion you purchased. For the Physical Allocated Bullion Accounts, you can pledge your stored physical precious metal bullion as collateral allowing you to raise cash for other use without losing title to your physical bullion. For the BullionCoin Digital Bullion wallets, you will generate income from all of the coins you created in the primary market and as a merchant you will be paid for all BullionCoin transactions you process. Why Not Try a Demo? You can freely open and try a demo account for our +100 gram wholesale markets to see how it looks and feels. The demo accounts comes pre-funded with $500,000 of virtual money for you to place pretend trades. Try buying gold, silver & platinum on any of our international precious metals markets. You are under no obligation to open a real account if you try the demo, so you have nothing to lose with much to gain from your insight. Questions About Buying Gold, Silver & Platinum or Setting up Your Holding? Don't be afraid to ask us about anything you aren't sure of. It's been estimated that less than 1% of people in the USA (even less in other parts of the world) have actually bought physical precious metals, so please feel free to contact us with any questions you may have. Why not do something different today by taking the first steps towards removing yourself from total dependence on the banking and financial systems? Take charge and responsibility of your own finances by creating a precious metals account with GoldVu now.